i chose this title over "running with the bulls" because it makes me sound like i'm cultural and in the know. and i'm going to continue to hope there's some small part of you that believes that, despite my obvious reliance on google/lonely planet on this trip. 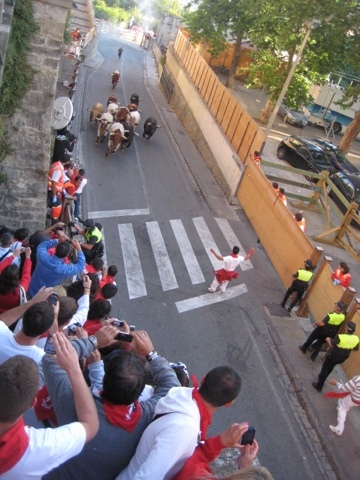 anyway, as fate would have it, once again it seemed that the place and timing i was in aligned, as my friend and i realized shortly before arriving in barcelona that we would be in town during the exact week of the infamous "running of the bulls" in pamplona, which is only a few hours away by train. despite this discovery, we decided we would continue to arrive in spain completely unplanned, and hope that we could gather some advice along the way on the best way to make sure we could take part in this world famous event. 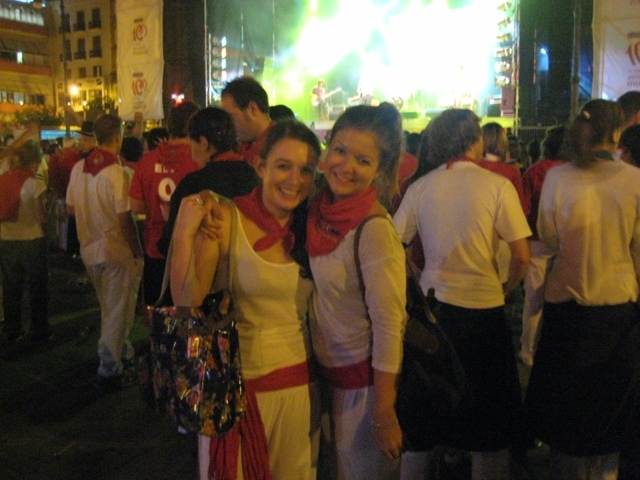 as one would expect, when we questioned the staff at our hostel, we were assured that the easy part was getting to pamplona, but that there would be no accommodation whatsoever for us to book, as most normal people book months in advance. 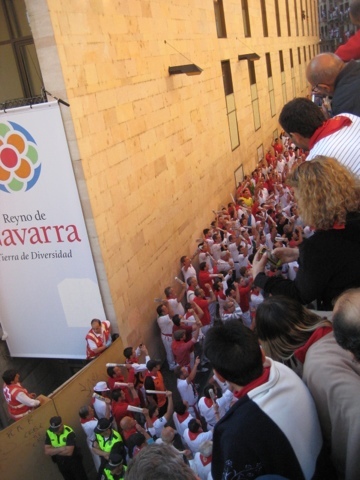 there was only one option available really - we could take an afternoon or evening train, arrive in pamplona, stay up all night drinking, watch the bull run at 8 am, and then race the crowds back afterwards to get a train to barcelona and sleep forever. knowing that this option would not only ensure the experience of a lifetime, but also offered up guaranteed "badass" points, we decided to take our chances and booked a ticket on the 6:40pm train, scheduled to arrive in pamplona at about 10:30pm. arriving at the train station. 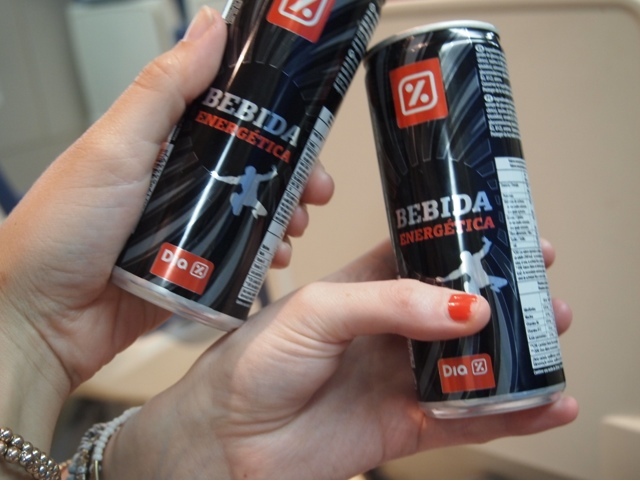 we arrived in pamplona ready and rearing to go, revved up on bebida energética, which we bought at a grocery store hoping that "energética" indicated it was a red bull knockoff. throwing back a can for energy and the lighten the weight of our bags (we came prepared with 3 cans each), we got on the bus to town, arriving just in the midst of the fireworks display that begins the festival every night at 11pm. it was really a meeting of the minds with people from all walks of life - young 20 something's, families, drunk bums, senior citizens, and even a few couples with infants. it was only a fireworks display, it was interesting to see so many different groups of people gathered together for an event widely considered a large, drunken street party. though i remain hopeful that not all who attended the fireworks display were preparing for a night similar to ours. 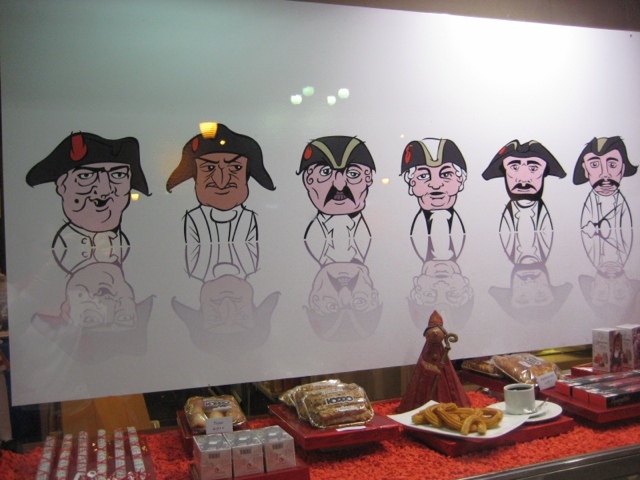 we ran into a shop to buy a few necessary additions to our outfits to blend in with the crowd (red neck scarfs, duh! ), and picked up what looked like a tropicana family sized orange juice bottle filled with sangria for 3€. any assumptions you now have about the quality of said sangria are likely correct, but at the time it was part of a cocktail of things we needed to stay awake. the night was pretty long, and i could probably go on for several entries detailing everything we did. in a sentence, we walked around, met a few different groups of people, found a random concert, danced in the streets, bought another sangria, did more dancing, ate doner kebabs, found a grassy knoll to deal with stomach pains from said doner kebab, had a quick coffee, and then went to the start of the bull run to hold down our position. catching a random concert? sure. 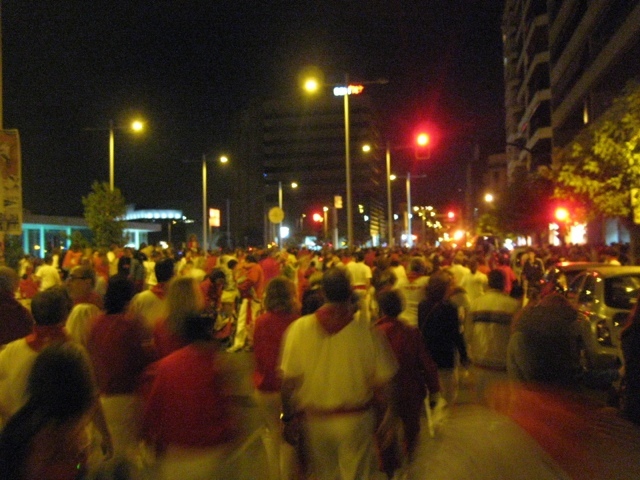 since we were staying up all night, we were advised not to actually run with the bulls. contrary to what it seems and the opinion of several completely unathletic people we met who were doing the run, it is actually pretty dangerous. when we were there, one of the injuries was a man who had a bull step on his face. holding down our prime location to watch the event from, however, proved to be an almost equally aggressive event. after about 3 hours of reserving our space, it was amazing how many people felt that they should be able to come up to us and either try to coyly push there way in front or even ask directly to have our space. the grumpiness from our lack of sleep paid off when saying "no" to these unbelievable creatures. one such "creature" was a woman in her 40s and her 20 something daughter, who neither pushed nor asked us to move, but stood literally on our heels and crooned their necks over our shoulders for the entire hour they arrived before the event. 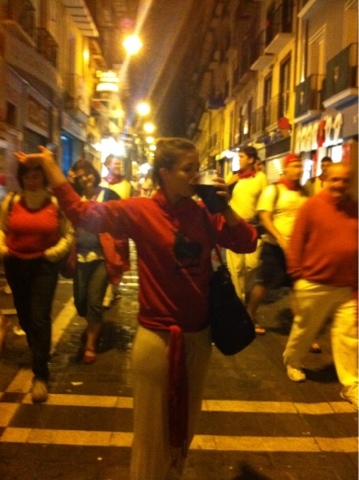 despite a spanish native couple we had made friends with telling these women off, they kept with the peer pressure up until the start of the event when they actually tried to physically shove my friend and i out of the way. guess NY isn't too far behind me, as my instincts led her to get a shove in return and our spots were safe. it wasn't exactly a girl fight of mob wives proportion, but not something i was happy to do either. after staying up all night and being in the same spot for 3 hours, your gut says to protect what's yours. and for some reason now, as i replay this scene in my head, the theme of nickelodeon "guts" is playing. perhaps that softens the blow that i had to shove someone?